Aircraft corrosion presents a constant threat to the structural integrity of aircraft and aircraft parts. Besides costing millions of dollars in aircraft inspections and repair work, corrosion can lead to massive safety risks if left untreated. Aircraft mechanics and technicians have to be vigilant in looking for signs of metal corrosion. Metal corrosion occurs after a period of contact with chemical or electrochemical agents, such as acids, alkalis, and salts. The corrosion can appear as a discoloration due to chemical deposits, or as a pitting of the metal. Depending on the type of corroded metal, the discoloration can be gray, white, green, or red (common rust). Pitting and etching can significantly weaken the strength of the metal and lead to cracks. A major contributing factor to aircraft corrosion is the climate. Aircraft that operate in marine climates are particularly susceptible to metal corrosion. While water vapor already has a corrosive effect, the water vapor and salt combination found in marine climates is a powerful corrosive agent. Areas that contain high amounts of industrial particles and fumes in the atmosphere also heighten the risk of corrosion. Generally, parts of the aircraft that harbor moisture or are constantly exposed to outside debris are corrosion hot-spots. After aircraft metal is manufactured, it is immediately protected with corrosion resistant alloy and coated with various metals, paints, and chemical conversions. However, the job is not finished - it will take continual inspections and preventative maintenance to keep the aircraft metal from corroding and needing to be replaced. The most important means for preventing corrosion is to keep aircraft free of moisture. A thorough rinsing and cleaning of aircraft will remove salt and other corrosive agents. Exposed areas such as the landing gear and cooling vents need extra attention, as well as any other joints, gaps, and hinges where debris collects. Chipped or delaminating paint needs to be properly striped or sanded and re-painted. Industrial-grade protectants and lubricants help seal the metal against moisture, and need to be periodically applied to aircraft. During severe weather or wet conditions, aircraft should be covered and sheltered. It is important to keep some form of ventilation, so moisture does not accumulate. With proper inspections and preventative maintenance, you can stifle the risk of aircraft corrosion. For more information, download a copy of FAA Advisory Circular (AC) 43-4A, Corrosion Control for Aircraft - it has good information on identifying and repairing corrosion on particular aircraft. 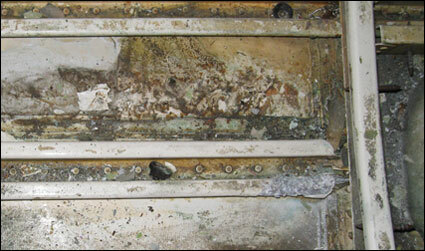 Learn more about aircraft corrosion - Sign up to our free Newlsletter!